Technology companies that provide mobility services, such as ride-sharing or navigation, are awash in widespread, real-time transportation data. Uber, Lyft, Waze, Apple, TomTom, and others have gathered massive amounts of data about the behavior of people and vehicles across the country. They know how long it takes people to drive from home to work in the morning, which roads are most congested, where and when accidents occur, and more. Some of these companies are making data available for free to the public sector: Uber recently launched Uber Movement and Google-affiliate Waze provides data to users through its Connected Citizens Program.1 Uber Movement aggregates and anonymizes billions of trip records from various locations across the world, including four U.S. cities, providing travel times between census tracts or traffic analysis zones for specific dates or average days. Waze provides anonymized user-generated alerts, including information on weather, accidents, and traffic jams. These companies, and others, have significantly more data than they have offered to provide—including travel speed on specific roadway segments, police activity, occupancy rates, and specific ride-sharing information—but the data that are available still offer unparalleled insights into the transportation system. Importantly, transportation planners now have access to tools that may help them reduce congestion and the pollution it causes. The Texas A&M Transportation Institute estimates that the average commuter spends 42 hours per year delayed, costing them $1000 in wasted time and fuel.2 In some large cities, delays can cost drivers nearly $3000.3 And as if stop-and-go traffic is not frustrating enough, it is also a major contributor to local air pollution and climate change. 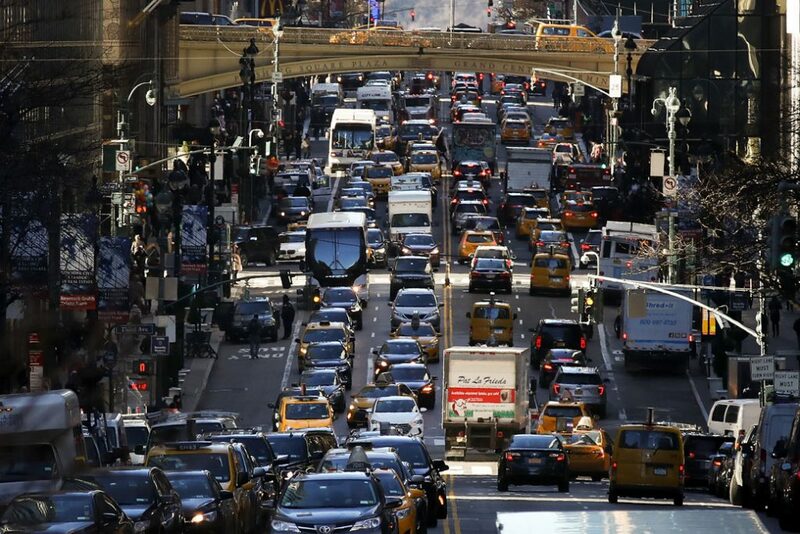 Nearly all of the millions of vehicles on the road burn fossil fuels, and they consume more when stuck in traffic. Large traffic volumes and high vehicle miles traveled in a region typically contribute to congestion emissions, as does poor traffic flow.11 More vehicle travel intuitively leads to more emissions, while traffic flow is more complicated. Below about 20 miles per hour, emissions rates of CO2 and other air pollutants—including PM, CO, NOx—are significantly higher.12 Getting vehicles out of stop-and-go traffic can reduce emissions, provided that the reduced congestion does not encourage more driving by people who currently forgo inconvenient vehicle trips. To plan for and improve the systems they manage, transportation planners build models that forecast travel patterns, then craft detailed 15- to 30-year plans.14 Modeling involves collecting data describing where people go, when they go, and which modes of transportation they use in order to project how travel patterns and volumes may change over time. To make these assumptions, planners often rely on a variety of sources: traffic data, transit ridership statistics, census information, and household surveys of travel patterns. Household surveys are particularly important, but they are expensive to administer and thus only carried out about once every five to 10 years.15 And while these public sector data sets are improving, they are often limited and lead to poorly-informed decision-making.16 Low cost, immediately-accessible, and widespread data from private companies such as Uber and Waze could revolutionize transportation planning and management, particularly for congestion relief. Planners could use new data sets to identify traffic bottlenecks, for example, then test different operational or policy changes to fix issues. Transportation planners will only be successful in reducing congestion-based pollution if they fully understand the severity and causes of congestion in their area. Private sector data offer benefits over traditional sources—such as surveys—because models and traffic management systems can be updated more quickly and at lower cost. Instead of waiting five to 10 years for new survey results, planners can capitalize on free data from a source such as Waze, which provides information in real time. According to researchers at the University of California, Berkeley, as of September 2015, no cities routinely measure traffic volume, occupancy, and speed on main streets.17 Other research finds a severe lack of evaluation of congestion-reduction strategies.18 Planning in a big data environment will be far more informed, responsive to exogenous factors, and better at predicting and measuring the impacts of policy or infrastructure changes. There are myriad possible applications for this type of data collection. Data could be input into traditional transportation planning models, helping determine the size and location of future streets and bridges; the infrastructure needs around ports; or new locations for bus stops. On the traffic management and policy sides, new data could help explain where ride-share demand occurs and inform curb-space policies to reduce backups or vehicle idling. Data could help increase the efficiency of emergency response to traffic crashes and expedite traffic flow after accidents. It could also help determine when, where, and at what level to charge tolls for highway use to reduce vehicle travel during peak hours. These new private sector data sets could be key to fighting traffic pollution in the 21st century. Yet while these data are exciting, planners need to consider potential pitfalls. New data poses serious risks if not managed properly. First, the vehicle-based nature of these data sets could encourage driving as the primary mode of transportation in the United States. Second, demographic biases could skew models in a way that disadvantages vulnerable U.S. communities. Currently, the majority of these new data sources, including all of the freely-available ones, are vehicle-based. If transportation models become extremely dependable for vehicle-based travel but advances are not made in collecting, procuring, and integrating data about bicycles, pedestrians, and public transit, then planning solutions will likely skew toward vehicles. Companies such as Strava are starting to collect and market data for biking and walking,22 but few other companies are making such efforts, and there are currently significant paywalls. Congestion is a systemwide issue, so planners must use new data sources to enhance planning for all modes, or risk furthering reliance on vehicles and their associated emissions. Uber and other ride-hailing companies provide interesting and important data but could contribute more to congestion than to its solutions. According to a University of California, Davis study, if the service was not available, about half of ride-hailing trips would not have been made or would have been made by walking, biking, or public transit.23 Planners and policymakers need to be aware of the double-edged aspect of ride-hailing in transportation emissions and find ways to encourage lower-emission transportation options. Perhaps most importantly, new data may reflect biased accounts of where transportation demand and congestion occur. First, there is a danger of explicit and intentional bias when ride-hailing drivers choose not to drive in certain areas. One study of three ride-hailing apps in Seattle and Boston found that “the cancellation rate for African American sounding names was more than twice as frequent compared to white sounding names.”24 And anecdotal evidence has found that drivers strategically redline communities perceived as dangerous.25 Not all studies have found better service in predominantly white and upper-income areas,26 but planners must be mindful of potential biases when incorporating new data into their models. More commonly, there is a danger of unintentional bias. For example, Uber demand is inherently lower in areas that cannot afford Uber services or that do not have as many smartphone users, so data availability and reliability are limited in these areas. Several years ago, the city of Boston planned to partner with a mobile application company called Street Bump that collected data about road condition by measuring “bumps” passively sensed through the accelerometer in users’ phones. The data could then automatically inform the Boston Public Works Department maintenance team. Before deploying the app, however, Street Bump recognized that some populations—such as low-income people and the elderly—may be less likely to carry smartphones or to use the app, so the company was at risk for directing city services to certain neighborhoods over others. To account for this, Boston first gave the app to its road inspectors, who service all parts of the city equally. Then, the public was able to provide additional, supporting data.27 The success of Street Bump—which helped Boston identify utility covers, not potholes, as the biggest road condition issue—was predicated on accounting for inequity before incorporating the app into the city’s maintenance program. The same critical thinking must be applied to use of new transportation data for congestion mitigation. To reap the public health benefits of reduced emissions, all communities need transportation data and solutions that reflect their needs. The transportation community needs all the information it can get to help drive climate- and health-smart transportation policies. New data sources such as those provided by Uber and Waze could help reduce congestion-related emissions. But transportation planners must critically review these data sets and their applications; address issues of demographic representation; and look to nonvehicle modes for congestion solutions in order to ensure that the transportation system of the future is environmentally friendly, equitable, and multimodal.